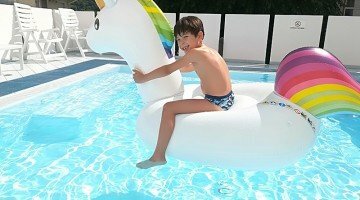 Piscinetta for children with h. max 30 cm. The Hotel Haiti is a 3-star hotel in Cattolica located in a pedestrian area, near the sea and the city center. It has a reserved covered parking just a few steps from the hotel, an area with a hydromassage pool and a sun terrace with loungers and WI-FI with Fiber throughout the entire hotel. Every day offers typical dishes of the Romagna tradition to be enjoyed comfortably in hot and cold self service buffet. It has been managed by the Cecchini family for over forty years. The hotel is located in Cattolica near the sea and about ten minutes walk from the Aquarium of Cattolica. It is located in a quiet pedestrian area of Viale Dante, shopping street and evening walks, close to the center. The rooms are all equipped with balcony, adjustable air conditioning, ceiling fan, WI-FI with fiber optic, 24 "HD LED TV, safe, private bathroom, hairdryer. COMFORT: complete with private bathroom with shower and adjustable air conditioning, from 11 to 15 sqm. FAMILY: equipped with private bathroom with shower or dressing and air conditioning, of 25 square meters. ECONOMY: complete with bathroom with simple shower and adjustable air conditioning, 13 sqm attic room. Swimming pool with hydromassage and paddling pool, sun terrace with loungers, free bicycles, open-air porch, bar, TV room, reading room, elevator and fresh water 24 hours a day. PARKING: reserved and covered, available to all customers (except for B & B stays). WI-FI : free in the whole structure and in the rooms with fiber optic connection up to 100 Mb / s.
AIR CONDITIONING : available in the dining room and in all rooms. CONVENTIONS : beach, amusement parks and restaurants. Organized excursions on request. BREAKFAST : sweet and savory buffet with homemade cakes, hot croissants, cereals, butter and jams, fruit juices, fresh bread, cold cuts and cheeses. LUNCH AND DINNER : self service buffet with hot and cold dishes that include fresh homemade pasta (tagliatelle, lasagna, passatelli, tagliolini) and second courses of meat and fish such as fried fish and baked pork leg, the stuffed romagnola and mussels marinara. And again, cooked and raw vegetables, fresh fruit and desserts. CHANGES : the hotel can guarantee specific menus for intolerances or allergies only if reported at the time of request for a quote. In the hotel: children's pool, indoor playground area, TV room with Wii for children, entertainment and mini-club during and after lunch, bicycles with seats, strollers, baby carriers, discounts for amusement parks, pediatrician on request and payment. In the room: cribs, anti-fall rails, baby baths and WC reducers. At meals: kitchenette for mothers 24 hours equipped with induction plate, pots, microwave, refrigerator, freezer, blender, scales, broths, oil and Parmesan, to prepare meals at all hours. Highchairs. On the beach: swimming pool with slide, games room, nursery, fenced children's playground area, entertainment service and mini club every day. The property has a 25 sqm swimming pool with a free hydromassage and a children's pool, and a sunbathing area with sun loungers. The hotel has an agreement with the Bagni n. 86/87/88. At guests' disposal: swimming pool for adults and children, hot tub, fenced playground and mini club, entertainment, baby sitter and baby dance, baby changing room and games deposit, fitness area with gym, aquagym, zumba, gymnastics, tennis courts Pong, table football, bowls, pedal boat or sailing trips, tournaments and organized games, lifeguard, WI-FI. 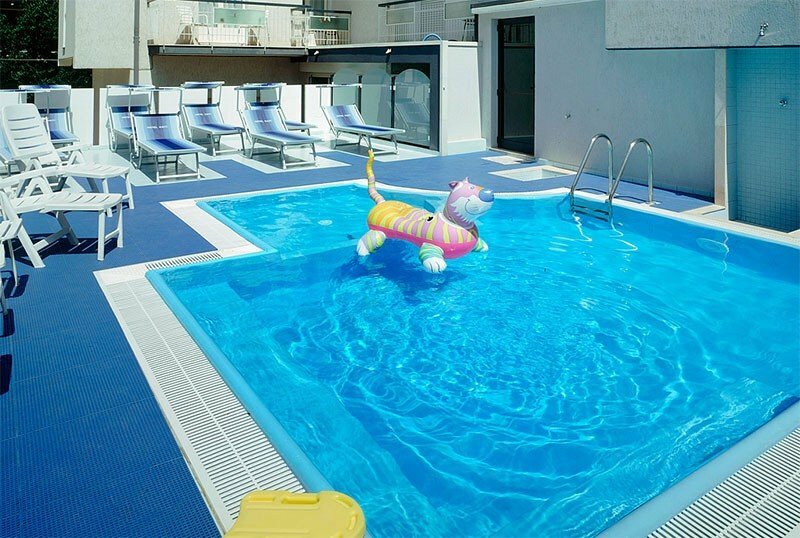 - Quadruple room 2 adults + 2 children up to 8 years - 3 days at € 400 in PC + Drinks + Parking. - 2 children up to 14 years completely free, in room with 2 paying adults. - 2nd child up to 12 years completely free, with 2 paying adults. - 2nd child up to 10 years completely free, with 2 paying adults. Last rooms at these prices - Last Minute Easter and Spring Bridges! - Weekly packages for stays between 18.04. and 29.04. The Easter holidays this year are very long! Easter package, starting from € 49.00 per person per day. Call now for a quote tailored for you! Bring your children up to 14 years free to the sea in June in Cattolica! The price and free tickets depend on the date of booking, the type of room and availability. Call for details of the offer. There is a way to approach the summer: book a beach holiday now.